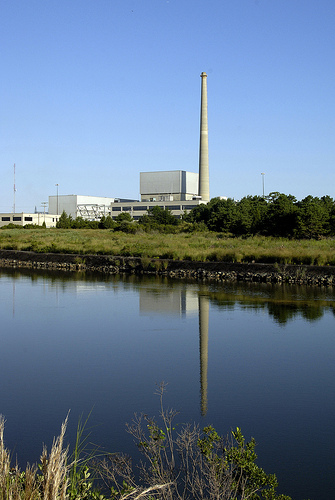 New Jersey’s Oyster Creek Nuclear Generating Station remains under an official Alert, a day-and-a-half after the US Nuclear Regulatory Commission declared the emergency classification due to flooding triggered by Hurricane Sandy. An Alert is the second category on the NRC’s four-point emergency scale. Neil Sheehan, a spokesman for the federal regulator, said that floodwaters around the plant’s water intake structure had receded to 5.7 feet at 2:15 PM EDT Tuesday, down from a high of 7.4 feet reached just after midnight. Water above 6.5 to 7 feet was expected to compromise Oyster Creek’s capacity to cool its reactor and spent fuel pool, according to the NRC. An “Unusual Event,” the first level of emergency classification, was declared Monday afternoon when floodwaters climbed to 4.7 feet. Though an emergency pump was brought in when water rose above 6.5 feet late Monday, the NRC and plant owner Exelon have been vague about whether it was needed. As of this writing, it is still not clear if Oyster Creek’s heat transfer system is functioning as designed. As flooding continued and water intake pumps were threatened, plant operators also floated the idea that water levels in the spent fuel pool could be maintained with fire hoses. Outside observers, such as nuclear consultant Arnie Gundersen, suspected Oyster Creek might have accomplished this by repurposing its fire suppression system (and Reuters later reported the same), though, again, neither Exelon nor regulators have given details. Whether the original intake system or some sort of contingency is being used, it appears the pumps are being powered by backup diesel generators. Oyster Creek, like the vast majority of southern New Jersey, lost grid power as Sandy moved inland Monday night. In the even of a site blackout, backup generators are required to provide power to cooling systems for the reactor–there is no such mandate, however, for spent fuel pools. Power for pool cooling is expected to come either from the grid or the electricity generated by the plant’s own turbines. As the NRC likes to remind anyone who will listen, Oyster Creek’s reactor was offline for fueling and maintenance. What regulators don’t add, however, is that the reactor still needs cooling for residual decay heat, and that the fuel pool likely contains more fuel and hotter fuel as a result of this procedure, which means it is even more at risk for overheating. And, perhaps most notably, with the reactor shutdown, it is not producing the electricity that could be used to keep water circulating through the spent fuel pool. If that sounds confusing, it is probably not by accident. Requests for more and more specific information (most notably by the nuclear watchdog site SimplyInfo) from Exelon and the NRC remain largely unanswered. Limerick (PA) reactors 1 and 2, Millstone (CT) 3, and Vermont Yankee all reduced power output in response to Superstorm Sandy. The storm also caused large numbers of emergency warning sirens around both Oyster Creek and the Peach Bottom (PA) nuclear plant to fail. “Our facilities’ ability to weather the strongest Atlantic tropical storm on record is due to rigorous precautions taken in advance of the storm,” Marvin Fertel, chief executive officer of the Nuclear Energy Institute, a Washington-based industry group, said yesterday in a statement. Fertel went on to brag that of the 34 reactors it said were in Sandy’s path, 24 survived the storm without incident. Or, to look at it another way, during a single day, the heavily populated eastern coast of the Unite States saw multiple nuclear reactors experience problems. And that’s in the estimation of the nuclear industry’s top lobbyist. Or, should we say, the underestimation? Of the ten reactors not in Fertel’s group of 24, seven were already offline, and the industry is not counting them. So, by Fertel’s math, Oyster Creek does not figure against what he considers success. Power reductions and failed emergency warning systems are also not factored in, it appears. This storm–and the trouble it caused for America’s nuclear fleet–comes in the context of an 18-month battle to improve nuclear plant safety in the wake of the multiple meltdowns and continuing crisis at Japan’s Fukushima Daiichi nuclear facility. Many of the rules and safety upgrades proposed by a US post-Fukushima taskforce are directly applicable to problems resulting from Superstorm Sandy. Improvements to flood preparation, backup power regimes, spent fuel storage and emergency notification were all part of the taskforce report–all of which were theoretically accepted by the Nuclear Regulatory Commission. But nuclear industry pushback, and stonewalling, politicking and outright defiance by pro-industry commissioners has severely slowed the execution of post-Fukushima lessons learned. At a Consolidated Edison substation in Manhattan’s East Village, a gigantic wall of water defied elaborate planning and expectations, swamped underground electrical equipment, and left about 250,000 lower Manhattan customers without power. Last year, the surge from Hurricane Irene reached 9.5 feet at the substation. ConEd figured it had that covered. The utility also figured the infrastructure could handle a repeat of the highest surge on record for the area — 11 feet during a hurricane in 1821, according to the National Weather Service. After all, the substation was designed to withstand a surge of 12.5 feet. With all the planning, and all the predictions, planning big was not big enough. Sandy went bigger — a surge of 14 feet. “Nobody predicted it would be that high,” said ConEd spokesman Allan Drury. In a decade that has seen most of the warmest years on record and some of the era’s worst storms, there needs to be some limit on such excuses. Nearly a million New York City residents (including this reporter) are expected to be without electricity through the end of the week. Residents in the outer boroughs and millions in New Jersey could be in the dark for far longer. Having a grid that simply survives a category 1 hurricane without a Fukushima-sized nuclear disaster is nothing to crow about. The astronomical cost of restoring power to millions of consumers is real, as is the potential danger still posed by a number of crippled nuclear power plants. The price of preventing the current storm-related emergencies from getting worse is also not a trivial matter, nor are the radioactive isotopes vented with every emergency reactor scram. All of that should be part of the nuclear industry’s report card; all of that should raise eyebrows and questions the next time nuclear is touted as a clean, safe, affordable energy source for a climate change-challenged world. UPDATE: The AP is reporting that the NRC has now lifted the emergency alert at Oyster Creek.